The other morning I was in the backyard with my little guy when I was overwhelmed by one of my very favorite scents ever - Lavender. The several lavender bushes that I had purchased at Costco a few years back were in full bloom, and it smelled WONDERFUL! I saw that the bees thought it smelled pretty yummy to, so I ran in and got my camera and the macro lens and took a few pictures. 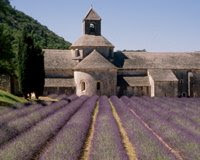 I think I love the scent of Lavender so much because just a whiff transports me back to Soriano nel Cimino, the tiny hilltop town near Tuscany where we stayed in Italy. We had a room in an old palace, and with masses of lavender in full bloom in the yard. We sat in these lounge chairs and looked over the lavender to the rooftops below. It was HEAVEN. Absolutely perfect! So then I got to thinking. What can I do with all this lavender? Is there something more I can do besides just putting it in a vase like this? I'd LOVE to make a wreath like this, but I don't think I have quite enough. Gather a bunch of laventer spikes, the longer the stems, the better. Be sure it is an odd number. I used 19. Using a spool of ribbon so that you have enough, tie it tightly just at the base of the flowers, leaving a tail about two feet long. Carefully bend each stalk up around the flowers to make a cage encompassing the buds. Then, using the ribbon that is still attached to the spool, start to weave over and under each stock. It is harder at first, but gets easier as you go. The 2 foot length of ribbon should be hanging loosely among the stocks. Continue around and around the flowers, pulling tightly each time. 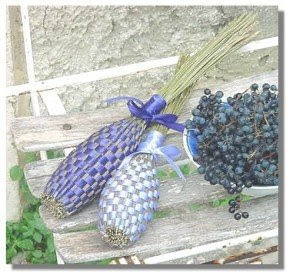 Over time the lavender will dry and shrink, and the ribbon will get loose, so keep it as tight as possible. This was my first attempt. Not nearly as pretty as those in the picture above my tutorial. My weaving was very uneven, the stalks were close together on one side and spread apart on the other side, but I was able to do some adjusting when I was finished. I used a 3/8" ribbon, but it would have been much faster and used less ribbon if I had used a wider ribbon, maybe 5/8". It was a pretty easy project, but did take a little time and patience. I didn't mind because I sat outside on a beautiful day. It was rather relaxing and the lavender just smelled so wonderful when working with it! I wondered what else I could do with lavender. I'd heard that you could cook with it, but I never had, so I went searching online again, and found a lot of wonderful recipes. I tried two easy ones. I looked at and combined several recipes for my Lavender Lemonade. Bring a gallon of water and 3 to 3 1/2 cups sugar to a boil. Remove from heat and add 2 1/2 cups fresh lemon juice and 7 - 10 sprigs of fresh lavender. Let cool, strain, and chill. Garnish with a a stock or two of fresh lavender. This lemonade is so, so good! The lavender gives it a light, refreshing flavor, and cuts some of the tartness of the lemons. I found this recipe for Lavender Shortbread on Food Network. It too is super easy, tender, and delicious. It is so aromatic, and the lavender gives it an interesting flavor. What a pretty little treat for a tea party, or given as a gift in a pretty little tin. The recipiant would open the tin, and just smell lavender! Nice. Isn't it pretty two with the dainty lavender buds and sprinkled sugar. Girl food for sure! I really wish I could upload the wonderful scent of lavender on the internet for you. But try the lemonade and shortbread. You'll be in for a treat! Have you ever cooked with lavender? 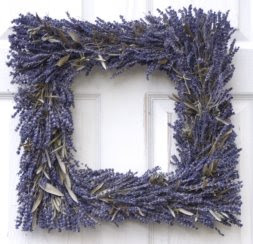 What other projects have you done or wanted to do with lavender? Hello all! 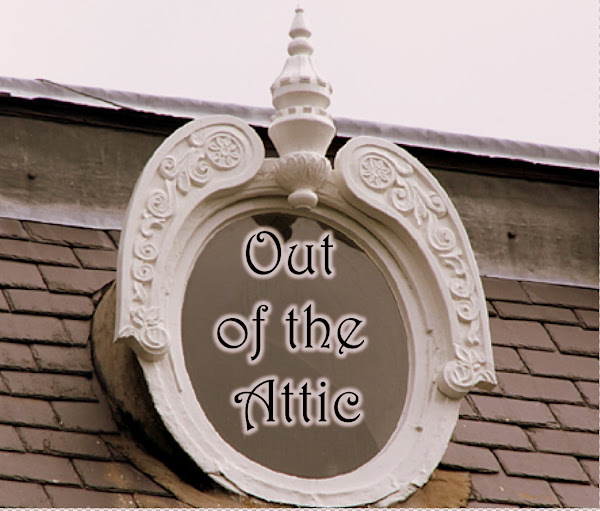 Welcome to the Attic. 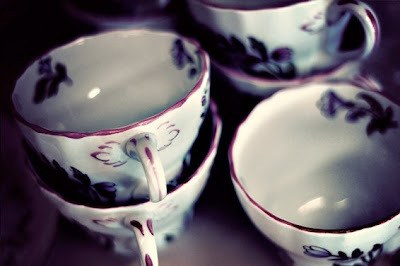 The Shabby Nest is having a Frugal Friday linking party for frugal decorating ideas. I just love a party, so I decided to link up. Head over to Shabby Nest if you want to join in the frugal fun. Being a garage sale fanatic my entire house is decorated on the cheap, but here are a few especially easy and fun ideas for frugal decorating. Enjoy! In the kitchen I was at a loss as to what to do with the soffits above the cabinets. I had a lot of them. I found an old book of botanical prints at a church rummage sale for only $8, picked out my favorite fruity prints and threw them into $3 frames fro Wal-Mart, mats included! A pretty great look, 11 framed prints for a total of $41. Of course you could do floral or fern botanicals, or prints of birds, etc., and you might even be able to find them on line for free. Of course the print plates in a book are just so nice and crisp. In the dining room I have simply hung milk glass plates with openwork edges from ribbon on the walls for a clean look. Milk glass can be easily collected at tag sales for about a quarter to a few bucks a piece. Remember my bulletin board from my toile post? It was just a huge old frame I got cheap at a garage sale and painted black. Then I got a piece of plywood to fit in it, covered it with batting, toile fabric, criss-crossed some ribbon and tacked into into place with upholstery tacks. Then just tuck in old photos, baby booties, gloves, and anything else that inspires you. In my bedroom I have a collection of oval florals that I have all picked up for a few bucks each, or less at garage sales over the years. Some are hand painted, some are prints, some decoupages, and even one is needlepoint. They all work together because they are all oval, floral, and have age. Pick something you like and just look and see how many you can collect for cheap. Every time I find another one, I just slap it on the wall. I love this romantic wall! In the guest bath I simply framed some old embroidered "His" and "Hers" hand towels that I found at a garage sale. I found the interesting old frames at a g.s. too, and quickly painted them white. Super cheap chic! In the same bathroom I have a collection of fun frames that I have also collected for cheap at garage sales. Most of the frames weren't white when I picked them up, but spray paint works wonders. Decorating on the cheap is easy, you just have to keep your eye out for what will work for you. Thanks for stopping by the Attic, and if you like what you see, then dig around up here some more. Happy Birthday Attic Gal Alysa! Today is Attic Gal Alysa’s birthday, and it’s a big one! A good friend would never outright tell a girlfriend’s age, but here are 40 reasons I love Alysa. 1.She is fun. Shortly after we met, we were walking down the hall of our church one evening. She spotted some balloons on the floor of the nursery room. “Let’s sit on ‘em!” she suggested, and in moments the two of us, grown women, had popped them all. I knew I would have a ball with this gal. 27. She has more friends than anyone I know of who isn’t rich or famous. 37. She is the most conscientious mom I know. 38, 39, and 40. She will always be older and wiser than me! Sure, our friendship has had its rocky moments, every relationship does. When we discovered that she loves her chocolate frozen, and I love mine just on the verge of melting, it was almost the end. But we pushed through that, and now our friendship is better than ever! I’m so glad. She and I are in the process of planning a dream trip to see the fall colors in Vermont, come October 2024 (as soon as our kiddos are grown and gone.) I can’t wait! But before that, we are planning a road trip to Utah next week to go the BYU Women’s Conference and celebrate her birthday. Yippie! Road trip with NO kids! We gonna have fun, girl! Crazy 'bout my Crazy Quilt! So, as I mentioned in my last post, I was at the San Diego swap meet, and I was rifling through a stack of vintage postcards. My family got tired so they went to the car. I said I'd be right there. So they took off, and I was making my purchase when I noticed something interesting wadded up on a small table back behind the seller, beyond reach of the public. I asked her about it and she told me didn't want to sell it. Apparently, she does estate sales, and when she saw this quilt, she really wanted to buy it herself, and she told herself that if it didn't sell today, then she would buy it for herself. I guess it wasn't meant to be, because I asked about it and she showed it to me, a bit reluctantly, I think. When I got a closer look all I could think was "Oh...my...goodness!" It was an amazing crazy quilt, obviously very old, made from small random pieces of lush fabrics: velvets, silks, brocades, and the like. I don't think any two fabrics are the same. And every piece is bordered with fantastic stitch work - a imaginative array of stitches. Then it had been decorated with embroidered images, embroidered appliques, and bits of ribbon. There is literally not a 3 inch square that does not have some kind of embellishment. It is almost overwhelming! The price tag said "$75 firm" and she was firm. (Of course she was. She didn't want to sell it.) But I was so amazed by this crazy quilt and intrigued by the unknown woman, whoever she had been, who had spent so many hours, and poured SO MUCH creativity into this one quilt, that I had to get it. Good thing my hubby had insisted I hold that cash, huh? I forked over the dough and tripped off to the car with my newly acquired heirloom. Whoever this woman had been, I had just adopted her as one of my ancestors - because she had obviously left her treasured quilt to me. Yes, hubby had a minor heart attack over the $75, but it was very minor and he recovered quickly. That night when we got home I started to do a bit of research on the Internet, and discovered what looked like similar quilts that were selling for around $3,000. We both felt better after that. So, you wanna take a closer look? This quilt is too much to take in all at once. It must be examined bit by bit. I learned that this quilt was likely made in the 1880s or 90s, and that crazy quilts were all the rage in Victorian America. There had been a Japanese Pavilion at the world's fair in the late 1870, and the crazy quilt was the quilting world's take on the Japanese look. The random pieces are reminiscent of the crackled crazing of the ancient Japanese vases on display there. Many believe that the term "crazy quilt" came not from the erratic style, but from the "crazing" of Japanese porcelain. When I look at that quilt, though, I have to think it was a little of both. How many hours did this lady spend on this quilt? I was surprised to find out that the crazy quilt fad was the scrapbooking fad of the Victorian Era. Women were really crazy about making crazy quilts - begging, borrowing, and stealing little scraps of luscious fabrics, searching for the perfect little applique or bit of ribbon that they could incorporate, and sharing and inventing new stitch work designs. Even the women's magazines of the day featured new stitch work patterns. These crazy quilts were not meant for practical use, but to show off the creativity and embroidery skills of the maker. The quilts were full with symbolism. Spiders meant gook luck for the maker of the quilt. Different numbers and colors of interlocking rings meant different things. On this one quilt my kids and I had fun counting 38 different embroidered flowers, 19 rings, 15 elaborately embellished circles, 11 snowflakes, 9 leaves, 6 owls, 6 animals, 6 butterflies, 6 people, 5 birds, 5 stars, 5 horseshoes, 5 feathers, 5 hearts, 4 fish and a fishbowl, 4 shoes, 4 fans, 3 spiders, 3 trees, 2 moons, 2 baskets, a fleur du leis, an anchor, a shepherd's crook, and countless star bursts. That really is crazy! In fact, women were so obsessed with creating their crazy quilts, it was becoming a problem. Here is a poem from Good Housekeeping, October 25, 1890. That nothing on earth her affections could smother? And is down in the parlor at work on another. And to which all the women are absolute slaves. Oooh, that hits a little close to home. I can get rather obsessed when I am embarking on a new creative endeavour. I think it is great, and I admire the pure creativity of these Victorian women. I love creativity, where ever it can be found. And here it is. My quilt is signed "A.N." I wish I knew who she was. Not a true quilt, most crazy quilts are only pieced, not batted. Here is what the back side looks like. Want to know more? There is an interesting article about Crazy Quilts here. So that's my find. Pretty great, huh? I have no idea what I am going to do with it. It begs to be seen in its entirity. So the burning question is: How did A.N. know when her quilt was finished? Do you have an old object that you just wish you knew the story behind it?